As I was thinking of what to write for this blog, I checked the Harvard Business Review and it turns out the methodology I started my company with is being praised. The Lean Startup process of starting any type of company requires the curator to validate what one thinks is correct by actually taking your idea or product to market at its inception. The skeletal theory that one has to create an in depth business plan is no longer what needs to happen in order for a business to come to fruition. In fact, innovative entrepreneurial leaders, teachers, and mentors advise using the the Lean Startup Methodology in order validate your business rather than base it off of assumptions. The Lean Startup is an approach for launching businesses and products, that relies on validated learning, scientific experimentation, and iterative product releases to shorten product development cycles, measure progress, and gain valuable customer feedback. The approach works for both existing and new business ventures. The whole concept revolves around science and testing business ideas before just launching them without consumer feedback. I chose this specific article because it is how I validated a business model based on actual consumer acceptance. My company ThreadMeUp.com went through an intense 20 week incubation with the Lean Startup Methodology and it really provides you with an infrastructure to building and carving out your business model. This type of process allows the entrepreneur an opportunity to pivot or iterate their model based on consumer feedback as opposed to a business plan which is not as adaptable. The framework for what I used in Lean Startup was called a “Lean Canvas” (Attached). My whole company and executive team is sold on Lean Startup and operating lean. We only do what we need and spend when we need it. I cannot praise this model enough because in a little under two months of business my company has reached $40,0000 in sales and rapidly growing. Much of this due to the methodology and train of thought learned in the Lean Startup. Companies are competing significantly more on supply chain management. There are many technologies that aid COOs and managers to gain a competitive edge to make their business more efficient, cost-conscious, and enhancing strategic operations. Modern businesses must transform the way suppliers, manufacturers, distributors, and customers interact globally. The developments of technology compensate for these challenges to help maximize operational efficiency to satisfy consumer expectations in immediate (‘want it now’) delivery. Before this course, I did not realize the big picture and that company’s survival depends significantly on supply chains. 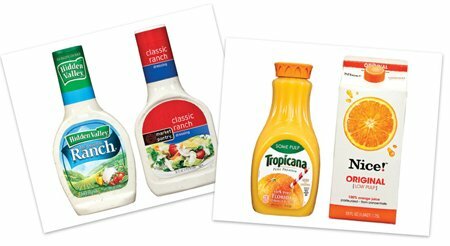 I thought competition was primarily based on their strategy (low-cost, response, differentiation) and how desirable their products are in the market. In class, we learned how different supply chain decisions impact strategy—such as low-cost, response, and differentiation. It is imperative for companies to adjust their approach on how they mitigate risk and react to disruptions of the factors in Process, Controls, and Environment appropriately. With technology and analytic tools, managers have the capability to plan, monitor, and forecast more concisely than ever before. This reminds me of when we discussed how supply chain decisions impact strategy. If the two concepts compliment each other, it can avoid setbacks and expedite the process activities to maximize strategic operations. The four basic process strategies we covered were process focus, repetitive focus, product focus, and mass customization. The type of product, volume produced, and variety of products must be taken into consideration when deciding which process to implement and how it will affect the strategic operations of the company. Process and supply chain activities affect the main strategies, low-cost, response, and differentiation. For example, operating a differentiation strategy, process characteristics are modular—process that lend themselves to mass customization. Or operating a low-cost strategy, the process characteristics will be to maintain high average utilization. It is evident from our class discussions that the interaction between supply chain management and strategy can determine how competitive a company is in the market. In early May of this year, a Kentucky man bought every last inventory item that a Kmart store had in Kentucky. Due to the store closing in only a couple of days, Rankin Paynter decided it would be best to buy everything the store had left and give it away to charity. He donated all items, from office supplies to clothing to Clark County Community Services. He was an unprivileged boy when he was younger only owning a pair of summer slippers as shoes. Now that he makes enough money to buy $200,000 worth of Kmart inventory, he is giving back to those in need. With Kmart store not selling enough to make up for their cost of goods, they are being forced to close down several stores across the country. Their inventory is just sitting in the warehouse or backroom or even their front of the store without selling. Because Kmart still has debt to pay, they are forced to liquidate everything they have, starting with inventory, to pay off their heavy loans. The cost of holding inventory is higher than having just in time inventory like DELL is known to have started. Even though there are several factors feeding into their decreasing sales, Kmart’s lack of efficient inventory management is costing them a lot more than just sales. 787 Dreamliner Debut…finally a dream come true? After years of production delays and costs overruns, November 4 marked the date for the historic use of the Boeing Dreamliner to finally take flight in North America. With suppliers located all over the world in a large-scale collaboration, delays should have been expected. Originally planned for its first flight in August 2007, problems with excess weight and manufacturing and other problems caused for five delays and the first model was delivered in September 2011. The first commercial flight service was on October 26, 2011. Orders for the plane came in before initial production and these delays have caused many unhappy customers and calls for compensation. It’s amazing that even with all of the delays, many airline companies have still continued to place orders. This extraordinary airplane has promised features that will supposedly astound not only its passengers but its flight crew and potential customers as well. With Boeing finally delivering on this exulted and greatly advertised product, will this plane meet its high expectations?For many of the people on this historic flight, the answer is yes. United Airlines is the first airline in North America to operate the use of the Dreamliner with a commercial flight from the George Bush International Airport in Houston to O’Hare Airport in Chicago. United Airlines celebrated this historic event with a ceremonial ribbon cutting attended at the departure gate by its senior level management and the 200-plus passengers. Many passengers commented on the design of the 219-seat interior plane as well as the tranquil atmosphere they experienced. Many noted the reduced noise from the engines, wings, and landing gears along with many of the other special features of the plane. Many new features include 30% larger windows with adjustable tint windows, spacious storage, dynamic LED lighting, a quieter cabin, and a smoother ride. The plane’s composition produces greater fuel economy, less maintenance, lower cabin pressure, and less time out of service. Attached above is a short video of the interior of the Dreamliner. Even with the delivery of this one Dreamliner, there is the possibility that Boeing can still face problems with its suppliers which in turn causes further delays with providing its customers finished products. So my question is even with all of these fantastic features of the Dreamliner, does it make up for the years of delayed delivery? With multiple airlines carrying this Dreamliner, what does that mean for the competitive advantage of a company? And with all the past production delays, is it possible that there are still faults with the Dreamliner? Black Friday shopping… minus the shopping?? There is no questioning the importance of supply chain management to a successful business. A supply chain disruption causes production to come to a screeching halt and has negative effects on business performance and shareholder value. When we discussed this topic in class, I could not help but think about the magnitude of issues that results from a disruption to the system. Especially with the pressure to improve efficiency and reduce operating costs, supply chain systems are becoming increasingly more complex and involved that one major disruption could end up costing a company a significant amount of money. Not long after discussing OM in the News examples in class of disruptions to supply chain management did we experience a devastating hurricane that not only affected the lives of those on the East Coast but also affected businesses everywhere. Hurricane Sandy was unforgiving as she tore through the East Coast. Articles such as Holiday Shopping Is Being Threatened By Crippled Supply Chains are surfacing everywhere speaking about the devastating consequences that came from damages to supply chains. Retailers suffered a huge blow because of all the damages to ports and rail lines, along with destroyed warehouses full of merchandise. 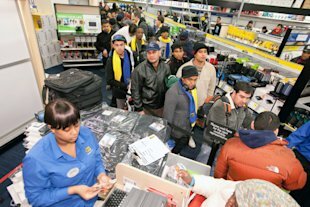 The effects of Hurricane Sandy may carry over into the holiday season and affect forecasted sales for countless businesses. Although these situations are less than desirable, they occur. I was curious about what businesses could do to soften the blow and be more prepared for these situations. I came across an article in the Wall Street Journal that tackled these very questions and had some insightful suggestions. Command and Control: Managing Supply Chain Risk interviewed Kelly Marchese, a principal with Deloitte Consulting LLP who specializes is supply chain management, regarding potential threats and risks the affect the supply chain and how business can be more prepared to sufficiently handle the situation. Kelly’s response was that companies need to make updating their technology a priority. Too many companies are attempting to manage global supply chains with technology that dates back 5+ years. The most important tool is to use technologies that provide simulation, visualization, and analytical capabilities. These new technologies have different benefits such as allowing managers to simulate different improvement initiatives and their impacts before actually implementing them. Kelly also stresses the importance of updating information management architecture to better connect all of the facilities and sites in the supply chain, especially since critical supply chain data from specific locations or regions is often overlooked since it isn’t available. However, these technologies do come at a cost and these costs may be difficult to justify, especially in our struggling economy. Do you think that improving technology is enough to solve a problem that has severe consequences to businesses? Is there anything else that supply chain managers should focus on to be better prepared for these moments of crisis? In 2010, Hewlett-Packards CEO boasted that it was the largest IT company in the world and still haven’t even hit their full potential. Since then H-P has gone through two different CEO’s and the company’s market capitalization has fallen significantly. But what caused such a drastic fall off? With all the leadership change at H-P, it has caused a lot of money loss because they cannot decided who should run the company, who’s plan to follow. There have been 4 different CEO’s since 2005 and that causes a lot of confusion within the work place because each CEO brings in a whole new feel. Also, each CEO has made cuts and lay offs, almost 75,000 workers since 2005. This has developed a lot employee moral around the company. Its hard to take pride and honor in your company when you are at the constant threat of being fired. H-P also has a major debt to pay off. The company has spend more that 67 billion in acquisitions since 2001. H-P is over 5 billion in debt so they have had to make a lot of cut backs, like the employee firings, but also in different areas budgets. For example, Research and Development lost a good deal of funding. This was a poor business decision by H-P because they are a technology firm and with technology everyone wants the newest, most updated model and thats comes by research and development. 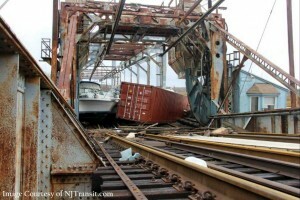 With these major blunders, what does H-P need to do to stay alive and turn the company around. What will new CEO, Ms. Whitman need to do as leader to turn the company around? 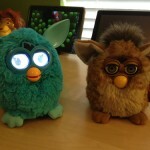 Furby’s were the must have toy when they surfaced around 1998. In 2011, eleven years after the Furby stopped being made, Hasbro was thinking up the Next Big Toy for the upcoming years and after much consumer research and focus groups, the decision was in the reboot the 90s class of the Furby. The toy that has the ability to change personality by the way the user interacts with it. Looking back, this gremlin-like toy is probably one of the most terrifying things to give a child, but as the world will have it, Hasbro is recreating the toy for the new younger generation. Wal-Mart and Toys R’ Us have both put the new and improved Furby on their Must-Have lists for the upcoming holiday season. 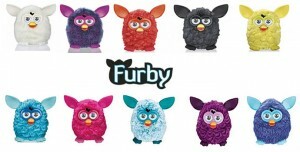 To modernize the Furby, the product designers are connecting the concept of a Furby with the “app toys” that will interchangeable work with Android and Apple devices by way of an app to connect that so many children are playing with these tech devices. The Furby isn’t the only toy redesign Hasbro is working on. They have a number of on going projects to retarget their toys to correspond with a higher tech level so they are more desirable to children. An interesting thing to consider is that the Furby was introduced in 1998 and quickly went through the product cycle until the cease of manufacturing in 2000. Furby’s could definitely fall under the category of all the other “fad” toys that came out in the late 90s and early 2000s that were always the must have toys of the season. In class, we learned about the product lifecycle and how all products go through an introduction, growth, maturity and decline. 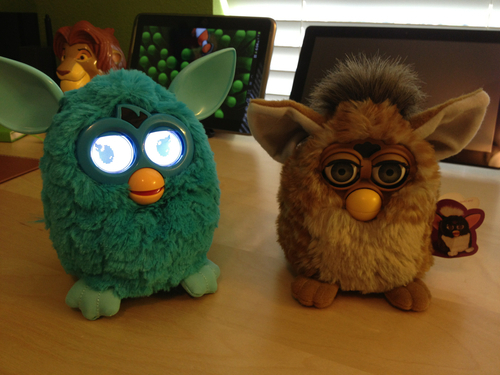 There is no doubt that the original Furby is well into the decline stage because Hasbro stopped making them in 2000. Because most children who had a Furby in their childhood are now somewhat grown up, Hasbro is able to reintroduce a newly designed Furby into the market to restart in the introduction stage of the product lifecycle. However, the new market of children is not the only one being targeted. Hasbro is also marketing to people in 20-year range as a retro toy, even though they are completely redesigned. 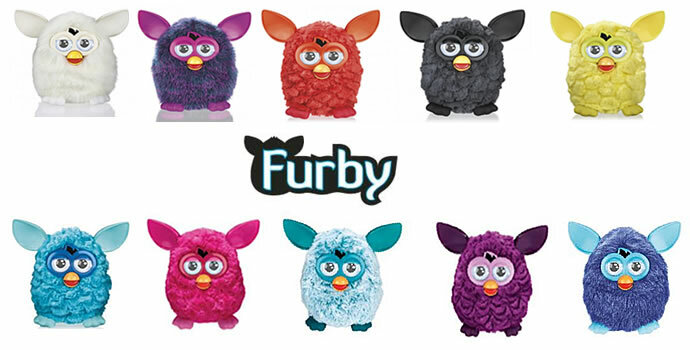 The new Furby was released this fall so it will be interesting to see if the product skips the growth stage all together and goes from introduction to maturity because the company has been through the stages of growth such as standardization with the earlier model. Do you think it was a good idea for Hasbro to recreate the extremely profitable toy from the 90s? If any of you had Furby’s when you were younger, would you consider buying this newly designed Furby? Do you think that the Furby has a chance to make its way fully through the product life cycle once again?